When introducing the “Elemental Firestorm” in 1989, DC Comics made special promotional efforts to get the word out about this dramatic change. The Elemental Firestorm was a fascinating character and a tremendous departure from what had come before. Two years prior writer John Ostrander had changed Firestorm from the classic Ronnie Raymond/Professor Stein combination to the more complex “Blank Slate” incarnation. Not content to rest on his laurels, Ostrander continued to evolve the character by revealing that Firestorm was actually a fire elemental. This new Elemental Firestorm was detached from human emotions and an environmental crusader. This was a new direction for the series and artist Tom Mandrake brought an entirely new look as well. What a great time to be collecting the character! I love me some Elemental Firestorm! Ostrander was pushing this book in different and thought-provoking directions, while Mandrake’s art created a unique mood to the series. This wasn’t just a straightforward superhero comic, this series had depth and substance. The elemental era of Firestorm walked the line between standard superhero comics and the mature supernatural titles of the time like Sandman and Swamp Thing (keep in mind this was before Vertigo). This new elemental incarnation first appeared in the final pages of Firestorm #85. 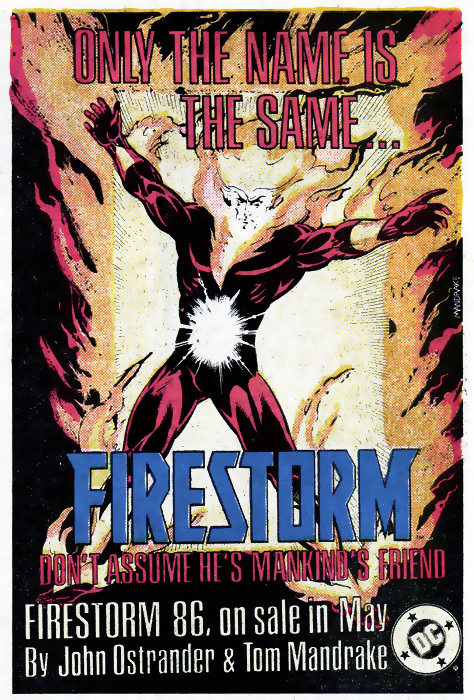 The letters page of that issue carried the following advertisement boldly declaring that Firestorm would never be the same. While Tom Mandrake didn’t draw issue #85, this advertisement within the issue marks his first published work on the character. In addition to house ads, DC was getting the word out to retailers about this dramatic change for Firestorm. Special preview copies of issue #86 were sent to retailers along with a letter from Bob Wayne, then Retail Promotions Manager. Below is the text from the letter. We’ve got a brand-new look for FIRESTORM. A look so different that we want you to take an advance peek at it! Writer John Ostrander has reunited with his former Grimjack collaborator, artist Tom Mandrake. Together, Ostrander and Mandrake will show you a new FIRESTORM… not just a superhero… but a force of nature! Will he remain mankind’s protector… or will he become its destroyer? An ongoing series in the DC Comics Standard Format (and part of The Janus Directive sequence), FIRESTORM #86 ships April 11 from Spartan Printing. Enjoy this preview of FIRESTORM #86. Click here to read the preview copy of Firestorm #86 (PDF Format, 5.3 MB), including the letter from Bob Wayne. My thanks to Jon over at the Fizzit blog for supplying the preview copy. Thanks Jon! I’m pretty impressed at the efforts DC went to attract attention to this new Firestorm. Today’s post was solely about the promotions surrounding the launch of the Elemental Firestorm. Sooner or later I’ll dedicate some posts detailing this fantastic era. It really was an amazing run and well worth your time if you’ve never read it. It was such a dramatic change that I think the reactions were very polarized. There was some good story-telling to come out of it and some major slaps in the face to longtime readers. I’ve made comments before on my opinion and I’ll wait until you get around to talking about it in depth before I make any additional penny-valued contributions. Thanks for the comments. For me, this was an incredibly exciting time on the book and a dynamic series of stories. If you are comparing how much you like the Blank Slate Firestorm versus the Elemental Firestorm, then the Elemental version wins hands-down for me. Sure it was a HUGE departure from what came before, but I think that’s okay. Sometimes a big change is what a book needs (i.e. Giant-Sized X-Men #1). Gerry Conway wrote an amazing run on Firestorm. If Ostrander had just done more of the same then he’d forever be compared to Conway. Instead Ostrander took the character in several new and unexpected directions. And he didn’t just change the character and let it stay that way. He kept evolving the character making him more and more interesting. I think the Elemental Firestorm had some really thought-provoking stories, was gorgeously drawn, and was one of the more engaging books on the market at the time. 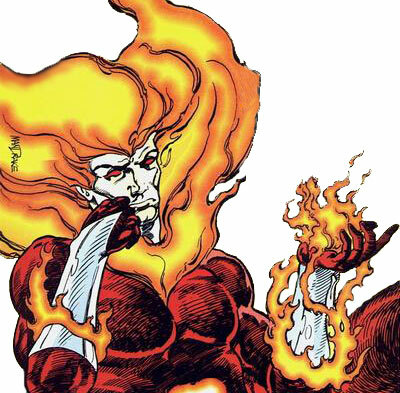 In regard to the costume, keep in mind the Elemental Firestorm look was designed by Tom Grindberg during his short run on the series. I think Mandrake took that look and made it fantastic! For me, the Elemental Firestorm drawn by Mandrake is as iconic as the Firestorm interpretations by Al Milgrom, Pat Broderick, Rafael Kayanan, and Jamal Igle. You’re obviously in favor of the change. Did Firestorm do anything more “right” than normal that made it work for you? (Was pre-reboot Firestorm that dire?) Or is it just that you seem to have a higher willingness to “trust” creators to take characters you like in interesting directions? Steven – Thanks for the comment and questions. You’ll laugh, but I was in favor of Superman Blue and Guy Gardner: Warrior. To defend myself, I knew the Superman Blue storyline would be temporary, so I was interested to see where they would take it. I was also a fan of the Silver Age Superman Red/Superman Blue stories, so I thought this modern-day version might be fun. In regard to Guy Gardner Warrior, it was initially done by the creative team of Beau Smith and Mitch Byrd. This comic totally rocked! Powerless Guy Gardner fighting Nazis, dinosaurs, and Zombies! Does it get any better than that?!?! I wasn’t thrilled with the Vuldarian stuff, but Guy’s personality was great. Beau Smith didn’t intend for the Vuldarian stuff anyway. That was a mandate from editorial. I think changing Firestorm was the right thing to do. Firestorm was an up-beat, standard superhero book. Unfortunately in the late 1980s and early 1990s, standard superhero books weren’t selling well. Look at the Will Payton Starman book. It was a GREAT series! A very traditional superhero comic, however, it couldn’t sustain the sales. I’m sure the folks at DC knew if they didn’t take a chance and change the book it would definitely get canceled. I think the change to the Elemental Firestorm was fascinating. We’d already seen the Plant Elemental (Swamp Thing) and the Air Elemental (Red Tornado), so a Fire Elemental wasn’t that far-fetched. Also, as I mentioned in the post, the stories were really good and thought-provoking. I hope that addresses your question. Thanks again for visiting! Thanks for the comments… they’re always interesting. I’ll refrain from further comment at this time, except to note that I can never see a reference to the Will Payton Starman comic without remembering that cover.